Resolution marks a major step forward for Mehmet Ali Sanlıkol, the musical polyglot, multi-instrumentalist, restless bandleader and prolific composer who writes in both contemporary classical and jazz but draws heavily from Turkish influences. His band Whatsnext? — a shapeshifting jazz orchestra that can be pared down to a combo, depending on his needs — is a force to be reckoned with, able to conform to the demands of Sanlıkol’s complex but accessible compositions and shift genres on a moment’s notice. The new album picks up where Sanlıkol’s What’s Next? — which Jazziz proclaimed one of the 10 best albums of 2014 — left off. The orchestra spent most of that record exploring pieces Sanlıkol had composed between 1996 and 2000; only the last composition was new, written in 2011. In the intervening years, Sanlıkol — who was born in Turkey in 1974 — immersed himself in Turkish music and began to grasp the connections between American jazz and the music of his native country. He wrote the music that populate Resolution in the summer of 2015, and more than ever before — perhaps more than anyone has done before — they point to the places where the two cultures meet. 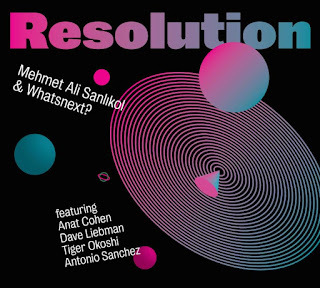 The music of Resolution is a direct outgrowth out of Sanlıkol’s desire to learn more about the music and culture of his birthplace. During what he calls his “Turkish decade,” he studied it intently — reading about it, listening to it and, eventually, composing within its framework of Middle Eastern modes, microtones and rhythms. “When I realized that I didn’t know much about my roots, that was a big shock, and I think it triggered something in me that deep,” he says. Sanlıkol adds other cultural touchstones to the mix. Though “The Turkish 2nd Line,” the song that kicks off Resolution, is obviously steeped in the New Orleans brass band tradition, the album is filled with references to other idioms — funk, R&B, rock, ’70s fusion, reggae and Ellington-style big band, to name a few. The first movement of the album’s centerpiece, “Concerto for Soprano Saxophone and Jazz Orchestra in C,” was inspired by the soundtracks of 1970s crime movies like Dirty Harry and The Taking of Pelham One Two Three. Mehmet Ali Sanlıkol was born in Istanbul in 1974, learned piano from his mother and began performing publicly at age 5. He came to Boston to attend Berklee College of Music on a scholarship. He has been leading bands in Boston since the 1990s, and earned master’s and doctorate degrees from the New England Conservatory of Music. He cofounded and serves as the president of DÜNYA, a Boston-based collective of musicians and an independent record label which presents contemporary music influenced by Turkish traditions. He has composed dozens of pieces for a variety of jazz and classical groups, and was nominated for a Grammy in 2014. Sanlıkol teaches at Emerson College and is a fellow at Harvard’s Center for Middle Eastern Studies.